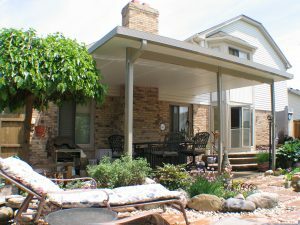 If you are in the market for a patio cover for your home in King of Prussia, Pennsylvania, the experts at SRA Home Products can provide you with a structure that is both stylish and durable. That’s because we install patio covers crafted by industry-leading manufacturer TEMO. Since 1970, TEMO has been a trusted name in the outdoor living product industry, and they have gained invaluable knowledge and experience that allows them to craft patio covers and other products that are second to none. SRA Home Products has proudly served homeowners in King of Prussia, PA, and surrounding areas since 1988. Since then we have completed more than 5,500 projects, and have earned an A+ rating with the Better Business Bureau thanks to our commitment to providing an exceptional experience for every customer. Our in-house factory-trained and -certified craftsmen will ensure a seamless installation for your patio cover while remaining respectful of your property throughout the entire process. For more information on the reasons SRA Home Products is the ideal company to install a patio cover at your King of Prussia, PA, home, contact us today. We will be glad to schedule you for a free at-home consultation.